Let's face it, there are very few people who enjoy cleaning their home let alone giving their carpets the type of rigorous cleaning they need twice a year. It takes time to pick up toys, clothes, and all the other messes that take up residency on a carpet but a thorough cleaning on the level of a professional not only takes exponentially more time but considerable effort as well. Additionally, when you consider that most people don't get the results they are hoping to get at the conclusion of the task it's not too difficult to ascertain why professional residential carpet cleaners are so popular. Professionals give carpet the type of cleaning they need in a fraction of the time it takes for laypersons to complete the job and their end results are unmatched. Residential carpet cleaning services work wonders for carpets that are cleaned regularly by homeowners, those that are in a state of neglect, and even those that endure heavy foot traffic and play. What are the benefits of residential carpet cleaning? It's a common misconception that carpet cleaners are for businesses only. In truth however there are a multitude of benefits to hiring a professional for your residential carpet cleaning needs. End Results - Let's start with the obvious. While some homeowners might rent a carpet cleaning machine from their local hardware store and might dedicate and entire day or even weekend to the task, the results these efforts produce are almost always less that satisfactory. This isn't for lack of trying but rather a product of ineffective equipment and lack of experience and knowledge. Hiring a professional to clean the carpets in your home not only restores your carpeting to a pristine state but it also protects them and extends their lives as well. Saving You Time - Whereas cleaning a home's carpets may consume an entire day or days, professional residential carpeting cleaners can tackle an entire home in a matter of hours. Many place teams throughout a home in an effort to be as efficient and timely as possible. There are teams that prep carpets while others are dedicated to vacuuming, steam cleaning, and even treating trouble areas. Why spend your free sweating or running back and forth to the store for tools and solutions when you could be spending your down time doing something you actually enjoy. The Right Tools - Many a homeowner erroneously believes that carpet cleaning rentals and retail bought cleaning solutions are enough to produce satisfactory results. In short, they're not. In fact most of these things do little more than wet carpeting and then vacuum up the water and the ineffective solutions that they lay down. They don't scrub carpets properly nor do they possess the type of power needed to produce great results. When professionals arrive at a home to clean it's carpeting, they come with industrial grade tools, solutions, and treatments. More to the point they come with the experience and training needed to operate and apply these things. It's also worth noting that some carpets require very specific types of care or might be damaged if the proper equipment isn't used. Professional carpet cleaners negate the need for worry or concern as they know what to use on which carpets. Typically, a home's carpet should be cleaned by a professional bi-annually. Of course some homes will need more frequent cleanings while others still might require less. What is really comes down to is just how much traffic a home endures. Homes occupied by large families and those with pets for example will need to be cleaned professionally twice a year, at the very least. Such homes often benefit from monthly visits. On the other hand a home occupied by a single person who frequently works and spends most of their time away their home will need fewer professional cleanings, provided that such persons keep their home clean. A consultation with a professional will give you a very precise answer to this question. What is the process of carpet cleaning? An initial vacuuming that removes loose and new debris. 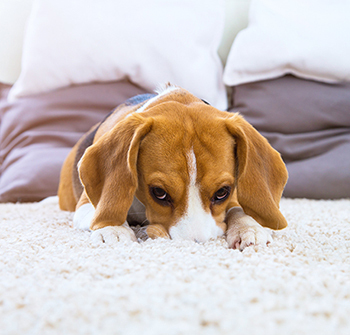 Carpets are sprayed with a special chemical that looses stubborn dirt and stains. Your furniture and walls are protected from tools and bodies by applied "corner protectors". A deep steam cleaning is handled utilizing a Rotovac along with eco-friendly solutions. Hot water is applied to recently cleaned carpet and then picked up via special vacuum which removes all remaining debris. What is the average cost of carpet cleaning? The cost of professional residential carpet cleaning varies from home to home but generally speaking, smaller homes and apartments run anywhere from $80-130 while large homes with, say 1000-1500 square feet, will cost an individual anywhere from $200-300. It's a very common misconception that professional carpet cleaning services are expensive or meant only for the wealthy. As you can see this is clearly not the case. Best of all quotes are free and give homeowners a more precise idea of what they're looking at.